This was written for a prompt on the spring equinox for a favorite small poem poetry group I belong to called “seize the poem.” I’m enjoying creating this mix of haiku and photography, and I think I finally got the words correctly balanced on the picture, so I’m sharing it here as well. The photo is my own taken in the sculpture garden of the Rodin Museum in Paris this month. 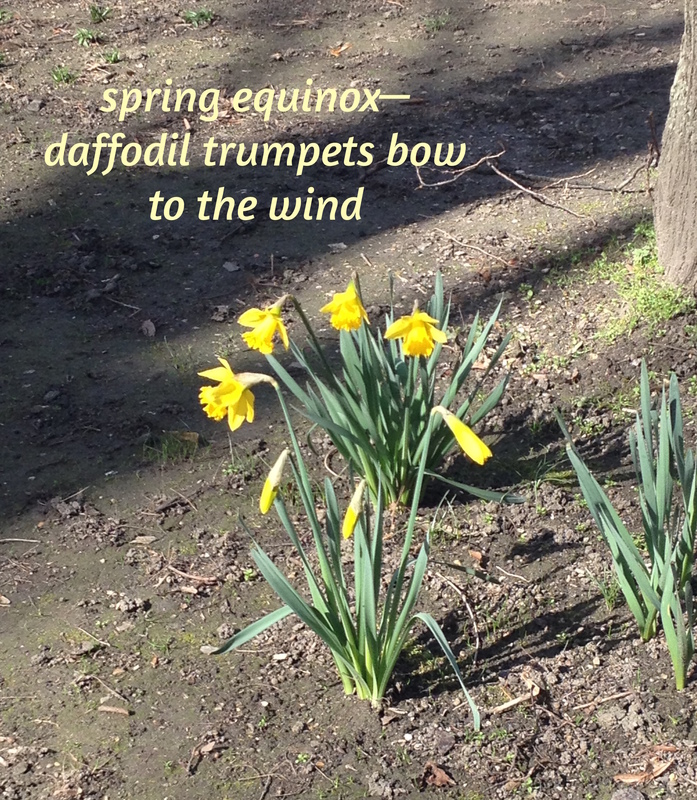 This entry was posted in flower poem, haiga, haiku, nature poem, poem, poetry and tagged balance of nature, beauty, daffodil poem, daffodils, ephemeral spring beauty, haiga, haiku, Mary Kendall, nature, renewal, reverence, spring equinox, spring poem. Bookmark the permalink. Very successful blend of poem and picture. I love the fact that the explanation of the poem is longer than the poem! Very lovely! Beautiful haiga. Nothing says spring like daffodils. I agee. I love them. Wonderful mix of cheerful photo with words for Spring!